It’s been awhile since I’ve seen a new honest-to-goodness Singapore label. 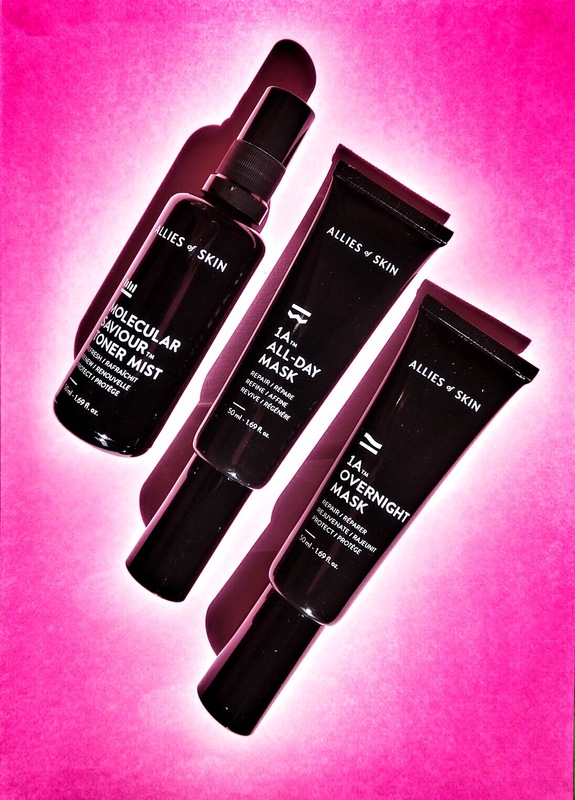 Allies of Skin was recently launched, and it will be hitting some of the hippest multi-label beauty stores in town and beyond. After roadtesting the made in the US-of-A products in its new 24/7 kit, I think the label has plenty of potential. The Molecular Saviour Toner Mist is made to tone and refine pores, balance, calm, soothe, moisturise, and protect. In my opinion, a good rose mist is indispensable. It can help with soothing eczema flare-ups and provide extra hydration without messing up your make-up, at mid-day. I always have one on my work desk. The Molecular Saviour Toner is not your regular rose mist. When I spritzed it on, I could feel that it has a thin viscosity, not just a plain wateriness like most others. It feels more like an essence and leaves my skin feeling supple. Perfect for prepping the skin for the application of heavier creams, for all-day moisturisation. And like all rose mists, the light floral scent is uplifting. When I looked closer at the ingredient list, I understood why the formulas feels more like an essence. It is packed with plenty of skincare ingredients. Amongst others, there is the anti-ageing and hydrating niacinamide; charged rose hydrosol (enhanced with a heavier molecular weight so it clings to skin instead of evaporating, says the brand); the antioxidant acai berry; antibacterial colloidal silver (not many skincare brands use metals so ingeniously in their products); lactobacilius ferment, a probiotic to balance skin (another unique ingredient); silk amino acids; and a blend of oils from the damask rose, juniper berry and cucumber seed. Next, there’s the 1A All-Day Mask for brightening, de-puffing, refining, tightening, protecting, and hydrating. Never heard of a mask that can be worn all-day; alone, or under sunscreen/ make-up. This relatively viscous mask feels more like a heavier gel moisturiser; much like Dr Jackson’s best-selling Face and Eye Essence. It kept the moisture sealed into my skin, which gets dry easily, from morning to evening. But layer the mist, an essence, and/or a serum underneath first. The mask helped my foundation to stay on nicely all day as well. The ingredient list proves that lots of thought went into this product too. There is hydrating hyaluronic acid of various molecular weight to keep skin supple on the surface and beneath. A variety of skin-firming peptides; a comprehensive blend of niacinamide, the powerful antioxidant astaxanthin, caffeine, acai fruit oil, blue-green algae. And a healing blend of bisabolol, honey, aloe vera, squalane. The 1A Overnight Mask is made for firming, moisturising and perking skin up. Essentially, it feels like most sleeping masks; gel-like but rather heavy, nourishing and pampering. It kept my skin hydrated throughout the night in an air-conditioned bedroom. The calming sleep-inducing lavender scent was another plus. I found that it worked best with my fave serum or oil blend underneath, as the mask seals everything in. The next morning, my skin also looked clearer. If you like, this could work as a heavy moisturiser too. There is time-released skin-rejuvenating retinol in it; as well as hyaluronic acid of a variety of molecular weight; the antioxidant ellagic acid; some exotic Indian ginseng; next-gen resveratrol that is supposedly more potent; a trademarked ingredient that prevents the glycation or yellowing of the skin; nutrient-rich oil blend of organic argan oil; Arctic cranberry seed oil; niacinamide; and even the antioxidant glutathione that I seldom see in skincare products. Allies of Skin products are also made to be “clean” of: parabens, alcohol, petrochemicals, phthalates and silicones. Interview with the Allies of Skin founder, coming soon.